Don’t torture your friends; just follow this method and accept that, with pie as with the piano, practice really does make perfect. This fresh fruit pie makes practice delicious! Last summer I sat by helplessly as my best friend from college became obsessed with making fruit pies. Daily texts, with questions and pictures, arrived. Phone tutorials were demanded. The coordination of a true lattice top explained. Several discussions about thickeners went down. But the crust? That’s the real issue, isn’t it? I always make mine and I almost always use a mix of butter (for flavor) and lard (for texture). If, however, you would like to buy a crust to make things easy on yourself, by all means skip down to the filling section. Still with me? For a double-crust or lattice-top piecrust I cut a total of 14 tablespoons of butter, lard or shortening (or some combination–I prefer half butter and half lard) into two and a half cups of flour into which I’ve stirred about two tablespoons of sugar and a teaspoon of salt. I cut the fat in using my fingers (I have very cold hands because all my blood is busy making my heart so very warm), but forks, knives and food processors all work wonderfully. I work the fat and flour together until the flour is rather sandy-looking but there are still some noticeable bits of butter in there. Then I stir in six tablespoons of cold vodka. You can use water, but the alcohol in vodka means there is actually less water in it to toughen up the protein in the flour, which means a flakier crust. Stir until the dough holds together in a shaggy mess. Turn it out onto a lightly floured surface and knead it a few times to hold it together. Divide in half, shape into two even disks, wrap and chill for an hour. Want a single crust? Halve the amounts above and don’t divide before shaping into a single disk. Roll out the crusts. Arrange one in a pie plate, letting the dough drop into the corners rather than pushing it in. Fold the other in quarters. Cover and chill both. 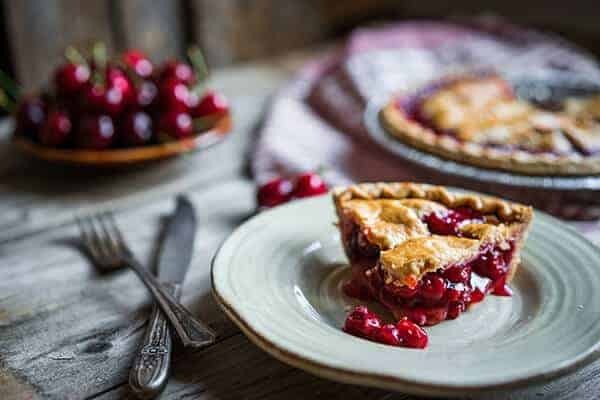 Filling: Start with just about two pounds of cherries (just under three pounds of peaches or plums or about five cups berries). Pit them and put them in a large bowl. Sweeten with about a quarter of a cup of sugar for a not-too-sweet pie and up to a cup for a real sugarfest. I prefer brown sugar in my fruit pies for the extra depth of flavor, but that’s me. Sprinkle with a tablespoon or two of tapioca starch or quick-cooking tapioca (flour makes things cloudy, cornstarch makes them slick, tapicoa thickens very nicely, I find), a pinch of salt, and a tablespoon of lemon juice. 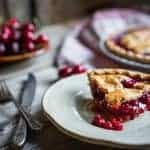 You can also add a bit of cinnamon, if you like, although I prefer just a bit of cardamom in cherry pie because it makes everyone talk about how delicious it is. I know some people who like a quarter cup of Armagnac in there. Pour the filling into the lined pie plate and top with the second crust. Crimp the edges so they stay together. Cut vents in the top of the pie. Put the pie on a baking sheet so any drips don’t make you have to clean your oven, and bake at 375°F until bubbling in the center and browning evenly all over, about an hour or even a bit longer.